Beach Weather and Some New Designers! Hello Friends, Hope you are having a wonderful day! It’s Spring Break for me and it is certainly Beach Weather as my title announced! Today over at Seize the Birthday we have a perfect “Topping” for this time of year, the topping is “Water.” The first thing I thought of when it was time to get crafty, was the beach. So I got out my watercolor brush and my new stamp set from Kitchen Sink Stamps and went to work. Living in Florida, I knew I would love this set and would be able to get lots of use out of it. It’s a 3 step stamp set, so I need a bit more practice but am still happy with my first time results. Not only does it have terrific palm trees, it even comes with tiny footprints in 3 different sizes too. They are so cute! The sentiment is from Verve. I thought it would be fun to cut out the center and pop it up with some foam. My friend Judy taught me that trick and I am forever grateful! Plus that stuff is cheap too! 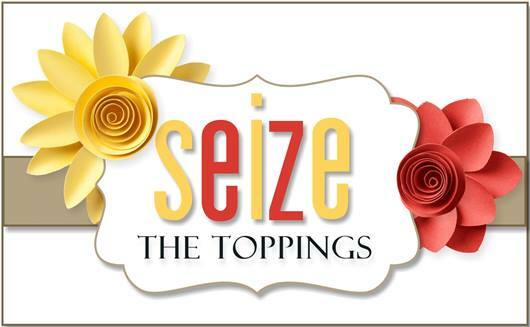 Now I have the pleasure of welcoming two new designers to the Seize the Birthday Team and I am super excited about it! The first designer is Vicki Dutcher, whom I am sure you all have heard of, as she has been stamping for years and years and puts out fabulous cards one right after another. I also have the pleasure of working alongside Vicki on my Just Us Girls team as well. We do a lot of behind the scenes work together and we make a good pair! The Second DT member is a good friend of mine Barbara Campbell. Not only is Barb extremely talented she is my Birthday Sister to boot! We met over this great world of the “Blogishpere” and have had the pleasure to meet in person twice too! I appreciate her taking the time to meet me more than she realizes! I am thrilled that both these ladies agreed to join my already fabulous team over at Seize the Birthday! WELCOME Barb and Vicki! Before I go I would also like to thank Jacquie Southas for being a wonderful Surprise Party Guest over at STB the past two months! Thanks for all your wonderful cards Jacquie and hope to see you in the gallery of ours from time to time! 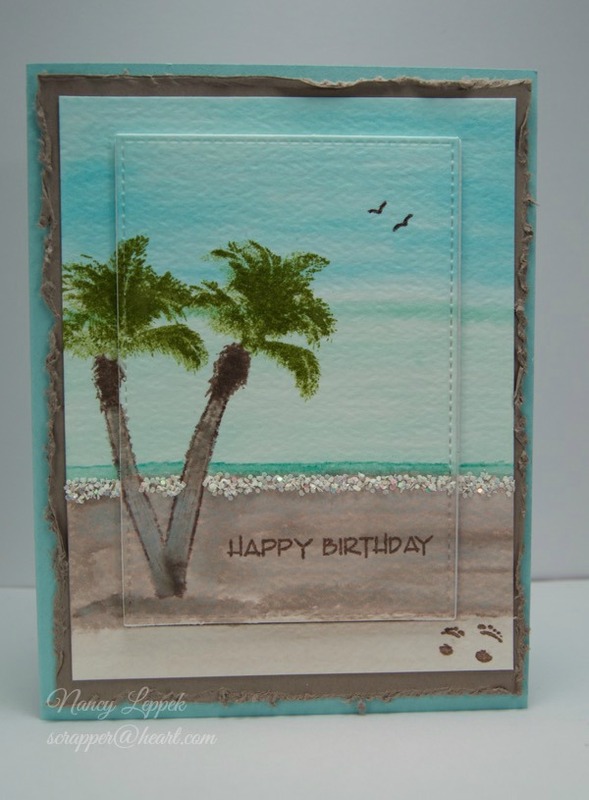 Categories: Cards | Tags: beach, Card making, Cards, Happy Birthday, rubber stamps, stamping | Permalink. Nancy, This is the perfect Florida water card. Those palm trees look great on your card. Soon they will be a memory as we go back home shortly. Thanks so much for a warm welcome to this blog. Looking forward to a great ride. What a neat beach scene. I love how you made it. I have not done any card making this week. But I saved a couple that I did last week to post on my blog anyway. Nancy can I just say this card is stunning!! Yes, your palm trees are gorgeous and I love how you raised it up, wonderful watercoloring my friend!! Happy Easter to you and your family! And congrats on welcoming a daughter to be in your family!! Super fabulous beach scene! Love how you did the surf! Beautiful and calming……lovely scene! Makes me want to go to the beach! What a great beach scene Nancy. Love the palm trees and the beach. So perfectly beachy! I LOVE those little footprints!! Great scene! Yes Nancy, I can see that you have the sea, sky and sand totally different from me, maybe I should try this out, it’s a lovely card. All I can say about this is wow… love everything about this Nancy.